Inspired by the hideous and tacky mascots of the Beijing Olympics, the Internet Surveillance Division of the Public Security Bureau in Shenzhen and the Beijing Police have adopted animated, noseless “censor-mascots” of their own, Jingjing and Chacha. 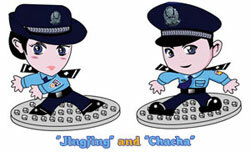 Note the play on words: jing cha means “police” in Chinese. Even as Chinese citizens use the Internet to respond to the Sichuan earthquake, Wired notes that network censorship has continued. Images of the two characters appear on all Shenzhen sites, bulletin boards and blogs to remind visitors to monitor their own behavior in accordance with the law, much as a visible police presence does in the real world. Clicking on Jingjing or Chacha takes visitors to a musical land of surveillance and self-restraint. The characters’ personal websites, which have rules for Internet use, also provide a chat utility for submitting questions or reports to real Internet police. What Chinese teen wouldn’t feel more harmonious after a live chat with Jingjing? The Chinese example is providing lessons to other nations who would manage their citizens’ network experiences. As the net is increasingly leveraged by protesters, expect other states to start building network surveillance capabilities, and to punish their online discontents.